Take advantage of the guesthouse's room service (during limited hours). Quench your thirst with your favorite drink at the bar/lounge. English breakfasts are available daily from 6:30 AM to 9:30 AM for a fee. Enjoy recreation amenities such as an outdoor pool or take in the view from a garden. Additional features at this hostel include complimentary wireless Internet access, tour/ticket assistance, and barbecue grills. 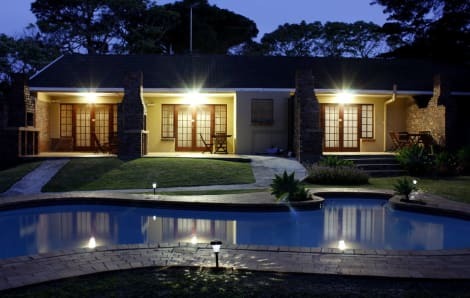 With a stay at African Aquila Lodge in Port Elizabeth (Walmer), you'll be within a 10-minute drive of Walmer Park Shopping Centre and St. George's Cricket Ground. This cottage is 3.5 mi (5.6 km) from Market Square and 3.5 mi (5.6 km) from Port Elizabeth City Hall. Located in Port Elizabeth (Port Elizabeth Central), Doncaster Cottages is within a 5-minute drive of St. George's Cricket Ground and Market Square. This cottage is 1.1 mi (1.8 km) from Port Elizabeth City Hall and 2.1 mi (3.4 km) from Greenacres Shopping Centre. Make yourself at home in one of the 23 air-conditioned rooms featuring LED televisions. Wireless Internet access (surcharge) keeps you connected, and satellite programming is available for your entertainment. Bathrooms with separate bathtubs and showers are provided. Conveniences include safes and desks, and housekeeping is provided daily. The Vic Hotel is set in 4 beautifully restored Victorian House in Port Elizabeth, a city in the Eastern Cape, at the end of the Garden Route, which stretches along Algoa Bay and boasts one of the country's major seaports. Visitors can expect blue-flag beaches, historical buildings, and an abundance of water sporting opportunities. Accommodation is available in 16 hotel rooms which are able to accommodate 2 adults each, and are each individually styled and furnished. Each room is contains air-conditioning, an en-suite bathroom, a flat screen TV with selected DStv channels and tea- and coffee-making facilities. Free Wi-Fi access is also provided. The Vic Boutique Hotel offers facilities equipped for your convenience which includes a warm and inviting lounge and a tranquil swimming pool for those warmer summer days. We also provide private parking with 24hr security on guard. The Vic Boutique Hotel understands that breakfast is the most important meal of the day. This is why we offer a complimentary halal breakfast to all our residences. Take advantage of recreation opportunities such as a seasonal outdoor pool or take in the view from a terrace and a garden. Additional amenities at this Art Deco hotel include complimentary wireless Internet access and tour/ticket assistance. Getting to nearby attractions is a breeze with the area shuttle (surcharge).